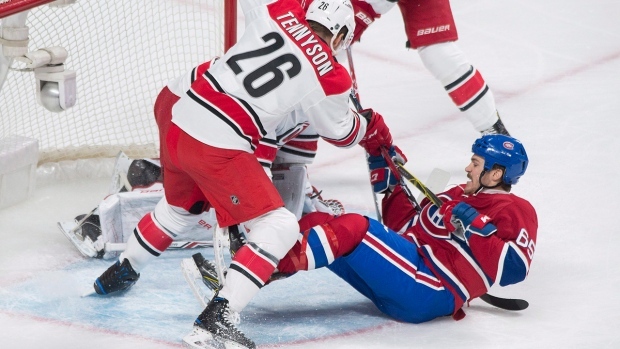 The Carolina Hurricanes’ five-game winning streak ended Thursday as the Montreal Canadiens rallied to win a 2-1 Thanksgiving thriller. Max Pacioretty broke a 1-1 tie just 14 seconds into the third period to record the winning tally. Carey Price made 31 saves, and Andrew Shaw also scored for Montreal. The Canadiens improved to 15-4-2 and avenged a 3-2 loss last week in Carolina, when backup Al Montoya was in goal. Elias Lindholm scored for Carolina, and Cam Ward stopped 21 shots. The Hurricanes dropped to 8-7-4. Pacioretty put Montreal ahead early in the third when he took a rebound of Tomas Plekanec’s shot off the end boards and banked it in off Ward. Carolina coach Bill Peters challenged that Plekanec was offside on the play, but the goal stood up to video review.